Animation – Can't I Scream In Peace? Robin/Damian Wayne in Batman Unlimited: Mechs vs. Mutants. Tom in the American version of Tree Fu Tom. Junior in Hanazuki: Full of Treasures. Gym leader Chili, as well as guest roles Maron and Thomas on Pokémon. Blue, Koffing, Kabutops, and Oddish in the TV special Pokémon Origins. Zoicite, Motoki Furuhata, and additional voices in the Viz Media dub of Sailor Moon and Sailor Moon Crystal. Young Durotan in World of Warcraft Lords of War Part III – Durotan. Amuro Ray in Gundam: The Origin episode III. 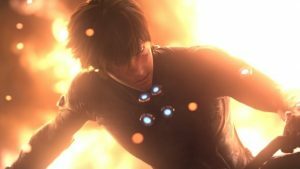 Kei Kurono in Gantz: O.
Norba Shino in Gundam: Iron Blooded Orphans, currently airing weekly on Toonami. Yukio Hans Vorarlberna in Bleach. Kota Fujiki in God Eater. Takumu Mayuzumi and additional voices in Accel World. Ja’far and additional voices in Magi: The Labyrinth of Magic and The Kingdom of Magic. Various guest roles in Hunter X Hunter, currently airing weekly on Toonami. Keita in Sword Art Online. Kenta Sakuramiya, Jiro Suzaku, and additional voices in Kill la Kill. Adolf Weismann, Tatara Totsuka, Masaomi Dewa, and additional voices in K.
Akim Papradon and additional voices in Blood Lad. Lucien provides voices for a variety of Barbie animated projects, including the voice of Pupcorn in the animated feature film Barbie: Starlight Adventure, as well as Honey the dog and various guest characters in the Barbie: Dreamtopia movie and animated series. Nello in Speed of Magic, one of Ferrari World’s most impressive theme park rides.